Have you heard? The upstate New York location of the 2018 Christmas Tree was announced Monday, and the gorgeous, 72-foot-tall Norway spruce will be arriving at Rockefeller Center on Saturday, November 10. Once the Tree is wrapped in lights (behind scaffolding), on November 14 it's topped with a new Swarovski star, and the 86th Rockefeller Center Christmas Tree Lighting takes place November 28. The lighting—free and open to the public on a first come, first serve basis—will start at 7pm and be broadcast nationally on NBC starting at 8pm. And look out Christmas lovers, the Grinch is coming! For the November release of the new animated movie The Grinch, a surprise alights on Rockefeller Plaza—a 26-foot-tall, tree-shaped stack of stolen Whoville presents, which the Grinch wants to give back to the people of NYC. Running from November 2–7, the interactive installation includes a growing heart for photos ops, plus the chance to win prizes. Meanwhile, ice skating action is picking up at the Rink. There's still time to beat the holiday crowds to the ice, and lots of dining packages to make a full day or night of it. Also book ahead to combine skating with breakfast with Santa. And the beloved toy store FAO Schwarz reopens on November 16. See Gigi Hadid on The Tonight Show talking about the toy-soldier uniforms she designed for the debut. For date night, the Rainbow Room celebrates autumn with the Harvest Moon Pop-Up in the next-door Gallery Bar on select November evenings. Reserve ahead to sip apple- and pumpkin-infused cocktails and snack on light bites and sweets while gazing out over the NYC skyline. November 3–15, the Tom Otterness sculpture, "Large Bear," will be on view at the Channel Gardens as part of the preview for the Christie's auction An American Place: The Barney A. Ebsworth Collection. That sale also features works by Joan Mitchell, Georgia O'Keeffe and Edward Hopper, among other greats. Learn more about Christie's upcoming 20th Century Week (in which a famed David Hockney painting is on the block); viewings begin November 4, and they're free to attend. Thanksgiving is just around the corner. 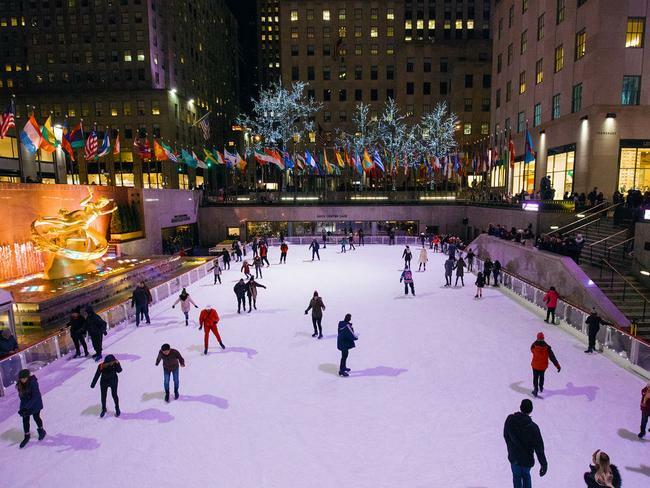 Rock Center Café and The Sea Grill both offer prix fixe Thanksgiving menus, and reservations are also available for the Rink and Top of the Rock on Thanksgiving Day. If you're looking for ways to donate and volunteer to feed hungry New Yorkers over the holidays, you'll find some ideas here, as well as at the Food Bank for New York City and New York Cares. And it's not too early to make New Year's Eve plans. The Rainbow Room and Bar SixtyFive will both be hosting luxurious bashes to send off 2018, and tickets are available online. Finally, don't forget to vote next on Election Day, next Tuesday, November 6, when Rockefeller Center transforms into Democracy Plaza. Find your polling place here.